A still unnamed "Russian investor" is the real buyer of Bulgaria's cigarette maker Bulgartabac, and there is no covert Bulgarian entities in the deal, according to the head of the Privatization Agency Emil Karanikolov. At a Parliament hearing, the top Bulgarian privatization official refuted numerous media reports and allegations by political figures that a Bulgarian entity connected with Bulgaria's Corporate Commercial Bank, believed to finance the media group of mogul Irena Krasteva, and Vinprom Peshtera as the mysterious buyer, which in turn are believed to be tied with the ethnic Turkish party DPS (Movement for Rights and Freedoms). The document for the purchase of a 79.8% stake in the Balkan country's dominant tobacco company was signed on behalf of the Russian bank by Alexandra Doychinova. BT Invest, owned by Russia's second-largest bank VTB , won at the end of August a tender to buy a 79.8% stake in Bulgartabac for EUR 100.1 M.
The contract bans the resale of the holding in the next ten years, a condition which can be skipped through a change in the ownership of BT Invest, analysts say. Austria-registered BT Invest, behind which stands Russia's second-biggest bank VTB, remained the only bidder for the Bulgarian tobacco monopoly after British American Tobacco and Austria-based CB Family Office Service dumped the sale. The deal has sparked protests by Bulgartabac workers, who oppose the sale of the cigarette maker to the only remaining bidder in the public procurement procedure and insist that the Governing Board rejects the offer. A Russian investment fund is the actual owned of BT Invest, according to Emil Karanikolov, who refused to reveal the name of the entity in question but said he would provide the documents for the deal to the Members of Parliament. Karanikolov answered a question by former Economy Minister and Socialist Party MP Petar Dimitrov, who asked who is behind the Austria-based buyer BT Invest, currently wholly owned by Russian state bank VTB, and what Bulgartabac's present assets are. The Privatization Agency head revealed that according to the consultant for the deal, Citigroup, a fair price for the 80% share of Bulgartabac would be anywhere between EUR 82.7 M and EUR 122.8 M.
"The guarantees for the Bulgartabac deal are 4-5 times greater than the sale prices. We have only sold the Holding's business – a market share of 34% and the production assets," Karanikolov told the MPs. According to Karanikolov, the guarantees on properties, production facilities, financial transactions and commercial brands with a total worth of EUR 450 M will ensure that the new owner of Bulgartabac will comply with the clauses of the privatization contract. Bulgartabac's properties are estimated by Colliers International to be worth EUR 42 M.
Russia's VTB bank currently owns 100% of the capital of VTB Capital, a company registered in Cyprus, which in turn is the actual owner of BT Invest, he said. He added that during the privatization deal talks, the Bulgarian authorities actually negotiated with both an Austrian lawyer who represented BT Invest, and with representatives of its Russian owners, VTB Capital. Since 100% of the capital of VTB Capital is owned by the Russian bank VTB, it cannot be considered an off-shore company," Karanikolov said, responding to criticism by former Economy Minister and Socialist Party MP Rumen Ovcharov. Ovcharov declared during the Parliament hearing that the Borisov Cabinet had violated the privatization conditions for the Bulgartabac Holding by selling it to an off-shore company. "There are definitely no Bulgarian players in VTB Capital," the head of the Bulgarian Privatization Agency claimed, refuting allegations that DPS MP Delyan Peevski, the head of the Corporate Commercial Bank Tsvetan Vasilev, and Vinprom Peshtera, an alcohol producers, have a share of 25% in VTB Capital. Vinprom Peshtera itself, through its subsidiaries, is already the owned of Bulgartabac's two former plants in Plovdiv and Stara Zagora. Two of the less profitable plants of Bulgartabac holding - in the cities of Plovdiv and Stara Zagora - were sold in 2009 through the Sofia Stock Exchange - for BGN 31 M and BGN 18 M respectively. During his hearing Wednesday, Karanikolov claimed, however, that the financial intelligence of the Bulgarian State National Security Agency DANS, is inspecting the declaration about the origin of the funds submitted by BT Invest. He did admit, however, that the Russian state bank VTB can sell BT Invest, rather than selling Bulgartabac, at any given moment, and that will not constitute a breach of the privatization contract. He further added that the selling of the Holding's assets – which is the real intention of the actual Russian investors if Russian reports are to be trusted – could be done only after the 5-year ban expires. According to Karanikolov, the fact that BT Invest has pledged to invest only BGN 7 M in the next two years stems from the fact that Bulgartabac already invested BGN 23 M in new equipment earlier this year, and the credit payments will be assumed by the new owner. He emphasized that the Bulgarian government has a great leverage over the new owner of the Holding as the Privatization Agency is entitled to change the guarantees under the privatization contract at any time, which even allows it to ban the owner from terminating the production of a certain brand of cigarettes. "We can get back 50% of the price of the Holding even if there are only structural changes in it," Karanikolov said. 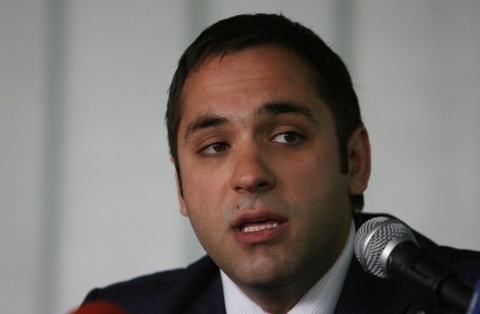 Rumen Ovcharov, whose term as Economy Minister in 2005-2007 was marked by a failure to sell Bulgartabac (allegedly because of the interests of the ethnic Turkish party DPS whose electoral base is largely constituted by voters employed in the tobacco industry), attacked the Bulgartabac deal by saying that it does not guarantee the company's future, and will actually help to destroy the Holding. He accused the Privatization Agency of chasing away the actual strategic investors. He read part of the agency's correspondence with consultant Citigroup, which he interpreted to mean that the consultant itself thought the Bulgarian state's criteria would not be to the liking of strategic investors. "You think we are total fools with this deal. This deal will be counted together with the sale of Balkan Airways and Bulbank among the most gruesome examples of privatization in Bulgaria. Boyko Borisov surpassed even Ivan Kostov with deal," Ovcharov said referring to Kostov, Bulgaria's PM in 1997-2001.